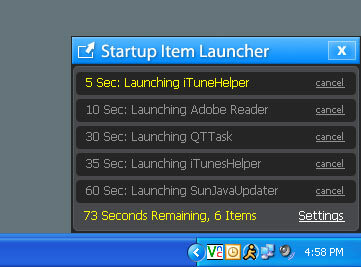 Review, disable, or delay startup items for faster startup speed. 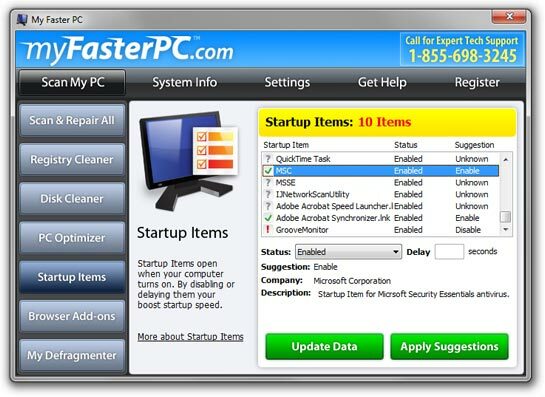 My Faster PC's Startup Items tool allows you to review and change which programs automatically load when you computer starts up. These programs are the ones that always "pop-up" after your computer turns on (like Instant Messengers, Antivirus Software, etc.). By disabling unwanted Startup Items, you can free up system memory and help increase performance. If your computer is especially slow starting up (or just slow than it used to be), you should be able to improve your startup speed. Just open the Startup Item tool and let My Faster PC manage all your startup items for you (using our huge database of startup items and suggested settings). Or manage your startup items manually and choose which programs to leave enabled, disable, or which to delay. Delaying startup programs is a feature unique to My Faster PC. It lets you still keep all your startup items and launch them, but delays them from launching immediately during startup. Having everything load at once during startup is what often causes your computer to lock up after your desktop loads. By delaying some of these items, your computer should be ready to use faster and you can monitor which startup items are loading through our pop-up interface.